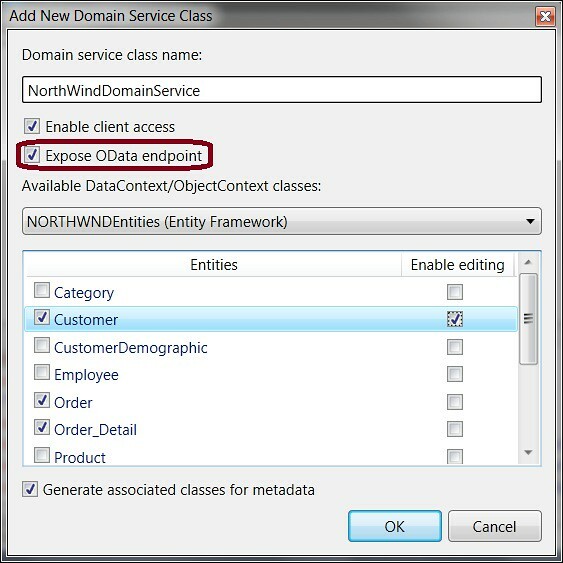 The purpose of this article is to show you how to open the application demonstrated in the previous article via an OData endpoint. We will then discover the limitations of this endpoint in the current release of WCF RIA Services and its differences with the features offered by the WCF Data Services framework. At last, we will see how to consume this endpoint from the Office Excel application and from a web application written with WebMatrix. Lastly, we’ve then seen some increasing usage of OData inside our Microsoft products. 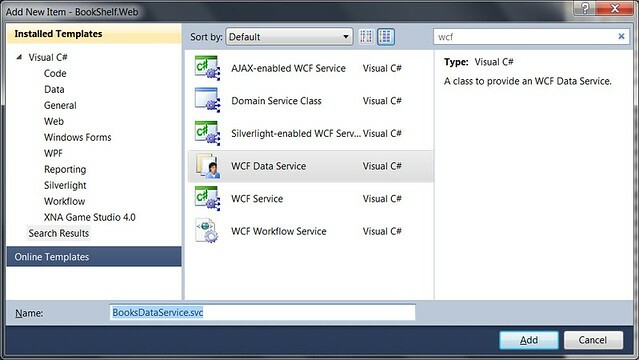 Developers can easily expose their data by using the .NET 4.0 WCF Data Services framework for instance. This framework will then consume a LINQ source, it will analyze it and it will expose it via HTTP REST. You will then have a CRUD support of your entities. You will have also a LINQ provider on the client side (Silverlight, WPF) to remotely query your data source. 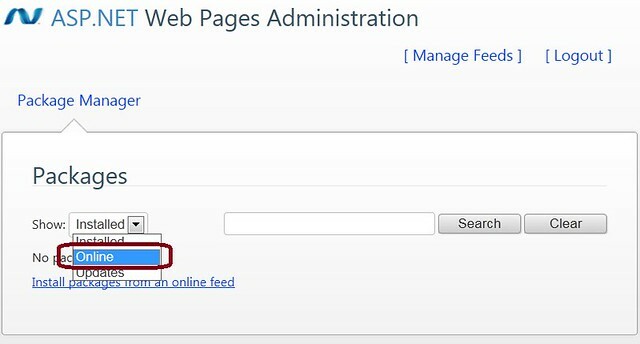 On the producers’ side, SharePoint 2010 can expose its lists through OData. SQL Azure can expose its databases directly through an OData feed by simply enabling a checkbox (currently only available through the beta program of SQL Labs). At last, Windows Azure exposes its data tables via OData also. Note: you’ll need to install & run the Silverlight OData Explorer application in the elevated trust “Out of Browser” mode to by-pass the native cross-domains calls limitations of Silverlight as I haven’t set a cross domain policy file on the root of my hosting. The OData version exposed by WCF Data Services is indeed very powerful and can be used perfectly in open & interoperable scenarios. However, the OData endpoint of WCF RIA Services is unfortunately today less powerful. For instance, if you need to remotely control the WCF RIA Services layer in a complete way from a WPF, Objective-C or even an Android client like a customer recently asked me, I would rather suggesting you to use the SOAP endpoint (more or less like a classic WebService then) or to use the JSON endpoint like we will see in the next 2 following articles. So why is it less powerful? Simply because the OData endpoint only supports read-only access to the entities exposed by RIA Services and it doesn’t support query operations neither. This is something we will maybe change in the next version of RIA Services but in the meantime you will have to deal with those limitations of this v1.0. The main need will be cover by the very high SL4 – WCF RIA Services – ASP.NET 4.0 productivity chain. The second need will be cover by the OData endpoint. You will then be able to connect mobile devices like Windows Phone 7, Android or iPhone iOS on your services without problems. http://services.odata.org/Northwind/Northwind.svc/Customers('ALFKI')/Orders to return the list of all linked orders to the ‘ALKFI’ customer. http://services.odata.org/Northwind/Northwind.svc/Customers('ALFKI')/Orders?$filter=OrderID gt 10700 to query among all the orders done by the ‘ALKFI’ customer and to return only the orders having an OrderID greater than 10700. An expression tree will then be built in memory, will be analyzed and transformed into the appropriate HTTP request when we’ll need it. As a reminder also, don’t forget that you can add, update or delete items on the OData feed available with WCF Data Services. 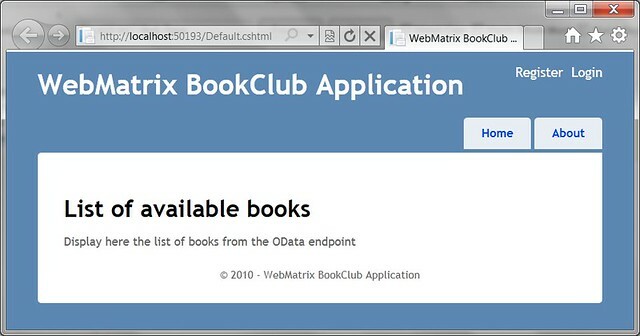 http://bookclub.cloudapp.net/ClientBin/BookShelf-Web-Services-BookClubService.svc/OData/BookSet to return the list of all books available in my SQL Azure database… and… that’s all! You will respectively receive the 2 following exceptions: “Requests that attempt to access a single element using key values from a result set are not supported.” and “Query options are not allowed.”. Well, you won’t say for this time that our error messages aren’t clear enough. Otherwise, you can still use both! 1 – You need to create a Web RIA application based on Silverlight and you need to have the optimum productivity on this application. This will be for instance the main back office application used internally by your company. 2 – You need to expose the same data on the public internet with support of read/write operations as well as queries operations for other types of clients like the iPad/iPhone/Windows Phone 7/Android devices. For the first point, this is still the Silverlight 4 & WCF RIA Services couple that will help you the most. You will then benefit from the tiedly .NET 4.0/Silverlight 4 couple for a high productivity chain offering a lot of the logic for you on the client side: high level controls, client-side validation, etc. For the second point, if you’re enabling the SOAP endpoint on your RIA Services DomainServices (like we’ll see together on the next article), you will offer read/write operations on your entities for the mobile devices specified above. However, you won’t have the native support of query operations like we just see in the full OData support of WCF Data Services. We could then imagine injecting the data model used by your RIA Services layer into WCF Data Services. Drawbacks: of course, there is some inconvenient to use the 2 frameworks in the same time in your project. First of all, this implies a double maintenance of the code as you’re rewriting some of the same logic in 2 different areas. Moreover, you have to handle the security access on the 2 frameworks also. Indeed, if you’re allowing updates only for a specific set of users using the security attributes of WCF RIA Services, you will have to reflect these security constraints on the WCF Data Services layer also. You will then see in the next article the benefits of using a unique framework (RIA Services) to expose our data on which we’re setting the appropriate set of rights. After this relatively long – but important – introduction, let’s now see how to consume our RIA Services layer from Excel. Note: we will use here the native features of RIA Services and its limited OData endpoint. We won’t use here the full OData logic offered by WCF Data Services. At this stage, we can already load a consequent amount of data inside the Excel client that will load all the entities in memory for further operations. 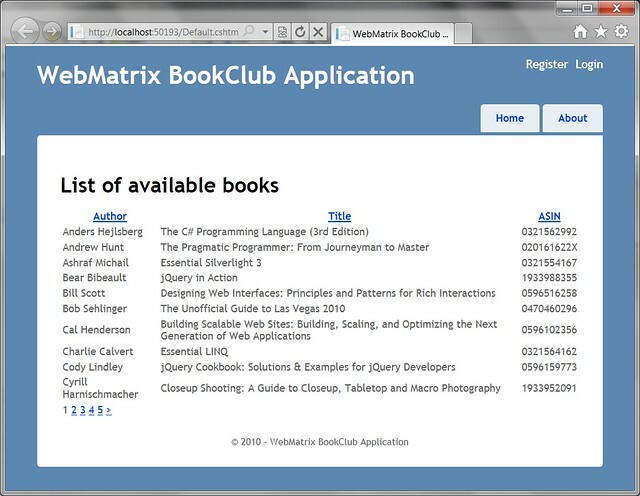 If you don’t know WebMatrix yet, you can discover this new free tool that helps you to simply build web applications via this set of nice tutorials & walkthroughs: http://www.asp.net/webmatrix/tutorials . If you’re an ASP developer who hasn’t moved to ASP.NET yet or if you’re a PHP developer curious to see what’s going on in the Microsoft space, this tool should interest you. Ok, let’s go. Let’s discover that thanks to the powerful helpers shipped for WebMatrix (that you can re-use in ASP.NET MVC 3 applications by the way) and thanks to the new Razor syntax, we’re going to build a nice little web application in a couple of steps to display our books stored in SQL Azure and available via our OData endpoint. Change the master page “_SiteLayout.cshtml” to find & replace the string “My ASP.NET Web Page” referenced 3 times by “WebMatrix BookClub Application”. We’re using here the OData helper to send the request to our WCF RIA Services endpoint thanks to the OData.Get() method. After that, we’re providing the result to another helper named WebGrid. 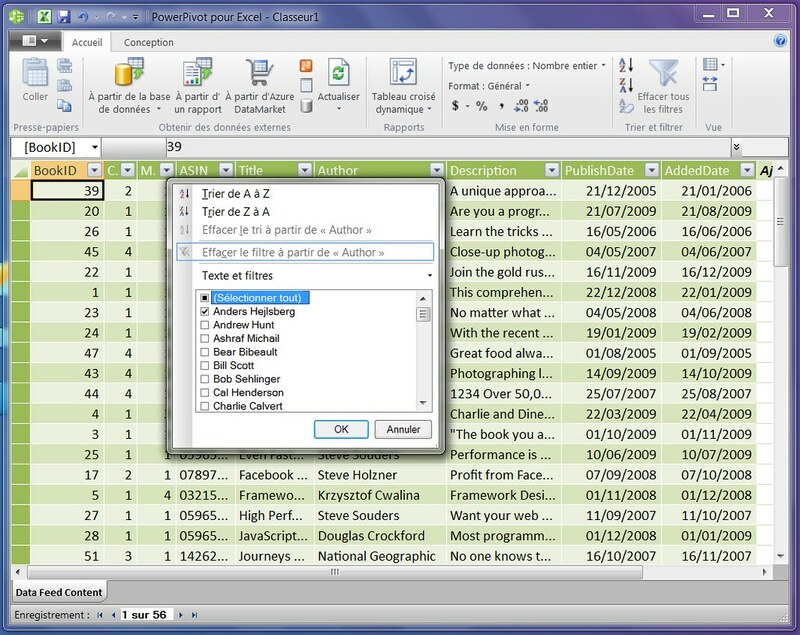 We ask it to sort the data by “Author” and to display it on pages with 10 elements maximum. At last, rather than displaying all the columns, we’re asking to the helper to only display the “Author”, “Title” & “ASIN” columns via the GetHtml() method . 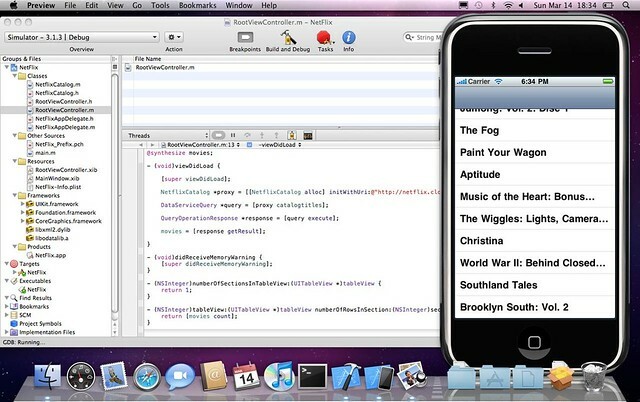 Very easy to code, isn’t it? In only 3 steps, we’re getting the data from the OData endpoint and we’re formatting them in a nice high level WebGrid control! 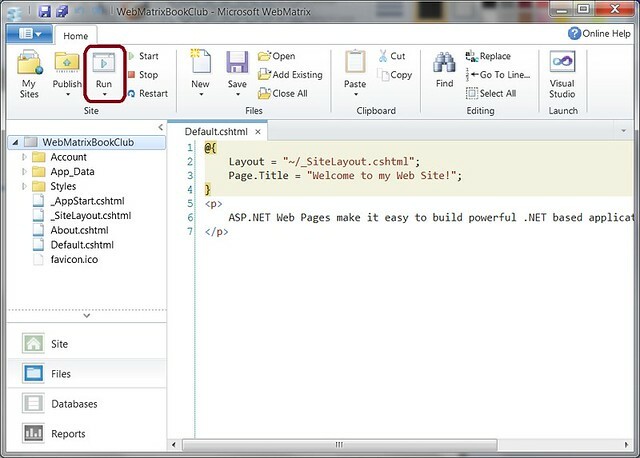 If you’re curious about the other features available inside the WebPages technology used by the WebMatrix tool, you can navigate here: http://www.asp.net/webmatrix/tutorials/asp-net-web-pages-api-reference . You’ll find other kinds of very interesting helpers to display a Twitter feed, to let your users say they like this page in FaceBook, etc. You can even re-use this new productivity approach and this new Razor syntax into bigger projects based on ASP.NET MVC 3. That concludes this OData article. See you in the next article where we’ll see how to expose the same service via a SOAP endpoint to enable a full access to WPF and/or Windows Phone 7 applications. Currently I am struggling with a project where I want to reuse the Ria Services of a silverlight app in a WP7 app. Since Consuming an OData service is the only built in support for WP7 at this moment, I exposed my Ria Service as an OData endpoint. All works fine except. When consuming a plain old WCF Data Service the entity references are created into the model I generated with the DataSvcUtil. But this is not the case when I consume a WCF Ria Service that was exposed as a OData Endpoint. Any Ideas? Or suggestions on Reusing existing WCF Ria Services on a WP7 app without losing entity references. 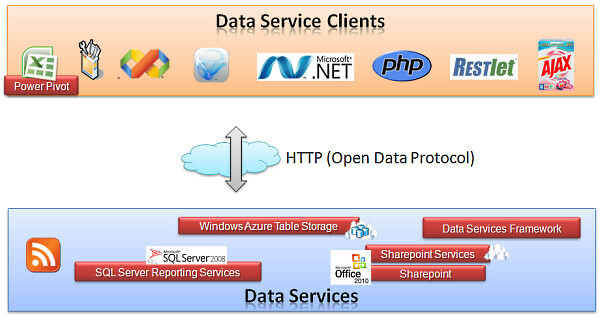 No, you should rather use the SOAP endpoint of your RIA Services layer for your WP7 client. I've shown you a sample here : blogs.msdn.com/…/how-to-open-a-wcf-ria-services-application-to-other-type-of-clients-the-soap-endpoint-3-5.aspx on how to expose the RIA Services layer via SOAP for a WP7 client. You will then have a full CRUD support + entities model created on the client thanks to this SOAP endpoint. very useful info you have put together here. Do you have anything to add on validation? particularly sharing rules between entity framework/ria services and mixed clientss e.g. Silverlight and ASP.Net. How would you do this?